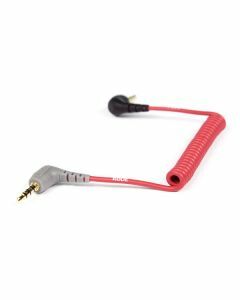 The SC7 is a high-quality shielded patch cable, designed to allow the VideoMic GO to connect to TRRS compatible devices such as the iPhone or iPad. The gold-plated contacts are colour coded, with grey indicating the TRRS output. The cable is colour matched to the red TRS to TRS cable that is supplied with the VideoMic GO, and is easily fitted by inserting the TRS (black) jack into the rear of the VideoMic GO and the TRRS end (grey) into the smartphone or tablet.